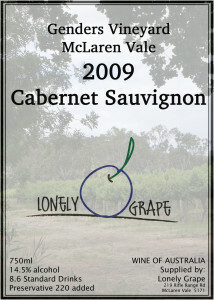 The first 2 wines of the Lonely Grape series have been a journey of exploration for me. I have worked with a local winemaker (more on that later) to produce small volumes of wine that have been blended just for me. The organisation to get the wine bottled was also done by me – I will talk about the bottling process next time. 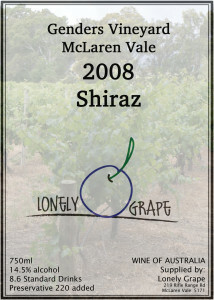 The local McLaren Vale winery involved was Genders McLaren Park Wines with Diana Genders as the winemaker. I have been a fan of Diana’s work for a number of years and always saw her little winery as an example of wineries at the cross roads. 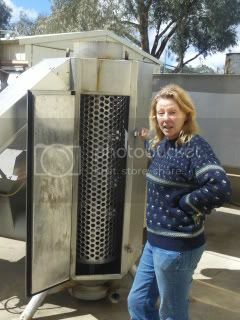 Diana is insistent that her wines are not released until they are to her liking. So to give you an example the current wine selections from Diana at the moment are a 2008 Chardonnay, a 2005 Cabernet and a 2006 Shiraz. Not many wineries do all the work – including the cellaring for you. Diana looks after the 26 acres of vines plus does the wine making on her own. She does not prune the vines or pick the fruit but most everything else (apart from some maintenance). As the wines are matured before release they are relatively expensive but in my opinion they are worth every cent ($20/bottle for the Chardonnay and $45 – $50 for the reds). At these prices and with Diana being very busy in the vineyard and the winery then the marketing falls behind. A few months ago I was talking to Diana about various ways to assist both our efforts to keep costs down and sell more wine when I noticed there was some wines from 2008 and 2009 still in barrel. One thing led to another and when I tried some of the various barrels I was hooked on the idea of working with Diana to produce an exclusive wine that I could market and at the same time assist Diana with selling some more wine (all be it as bulk wine). After discussing the idea with Diana the concept of a Genders Vineyard Lonely Grape Shiraz was born. Firstly we tasted all of the 2008 Shiraz barrels and I stumbled upon a 2011 Cabernet barrel that I just had to sample. From that moment on I was hooked on producing a Cabernet as well. When I found there was some 2009 Cabernet the concept just went from strength to strength. After tasting each of the possible barrels and looking at the various oak types and ages we went into deep discussion over what possibilities there were. The thinking continued as this process was only going to work for me if the wines were not quite the same style as Diana’s current releases as I wanted to be able to sell the wines right away and thus the wines had to have a more drink now quality even though I knew wines from the Genders Vineyard were long lived. Before I would agree with Diana on how much of the wine I would purchase I needed to understand 2 things. Firstly, my ability to pay for the wines and bottling. Secondly, how much did I think I could sell in a reasonable time frame. The first question was sorted out quickly however the second option took more time. I have been watching the happening in this industry for a while and my wine sales business is into it’s 4th year and I have seen a number of people grow grapes or want to make wine and then just go off and do that. This concept is great but without a sales and marketing plan these ventures have been doomed to failure. My work over the last 3 and a bit years has been based on doing things the other way around. I have a plan to make wine and become a producer but I was determined to work out about sales before I ran off and starting doing the romantic wine making thing. My science based brain would not let me go off and have fun – it needed to determine the fun was worthwhile first. Anyway with a sales plan for the break even point, including price points ($19/bottle for the Shiraz and $25/bottle for the Cabernet) was all sorted. Now for the commitment. Once I committed financially to the project the real fun started. There were time constraints as one potential customer wanted some wine before a certain date (which was not far away). So we had to get a move on. Working with Diana on this project was a joy. As you would expect she knew her wines and had a basic direction on what needed to be blended. Half of the barrels available were new french oak and it was obvious (even to me) that the oak in these wines needed to be toned down – this was done by adding wines from old oak barrels. The wine also needed freshening up so small amounts of other wine was added to the blend. Small additions of various wine from different barrels began. For me the trick was knowing what elements were needed to be added and then just what a difference these different additions made with such a small addition. As a scientist I understand the differences different elements can make but as a wine drinker I expected that a 1% addition was so small it would not change the wine. Oh how wrong I was! Through this process it was great to get the insight and direction from Diana (even a “trust me” occurred during the process). My next post will outline the logistical and bottling processes plus the origins of the wine labels (shown above). This entry was posted	on Sunday, December 1st, 2013 at 10:14 pm	and is filed under McLaren Vale, Wine. You can follow any responses to this entry through the RSS 2.0 feed. You can leave a response, or trackback from your own site.